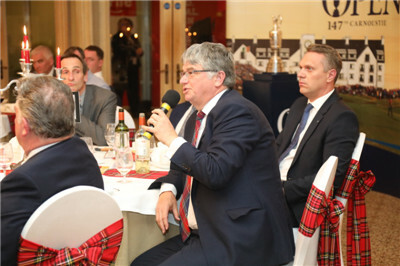 It is a real delight to join you, my Scottish friends both old and new, at the Scottish Chamber of Commerce (SCC) dinner on this lovely spring day. Last time I was here, it was a golden September day six months ago. It is great to be back and feel the strong pulse of China-Scotland cooperation. To summarise our cooperation, I would like to use three E's. The first "E" is elevated political guidance. At the beginning of this year, Prime Minister May paid a successful visit to China. During the visit, the leaders of our two countries agreed to build a more strategic, practical, global and inclusive bilateral relationship. Last month, First Minister Sturgeon visited China and came back with fruitful outcomes. The Scottish government is going to issue its third five-year plan on cooperation with China. This is strong evidence that the Scottish government attaches great importance and given strong guidance to developing relations with China. The second "E" is extensive trade and economic ties. Following the rapid growth of trade and economic cooperation in recent years, China is now Scotland's fourth largest export market and third largest source of import. In 2017, Scottish export to China increased by over 40%, twice the increase rate of total British export, with Whiskey export reaching £61 million. 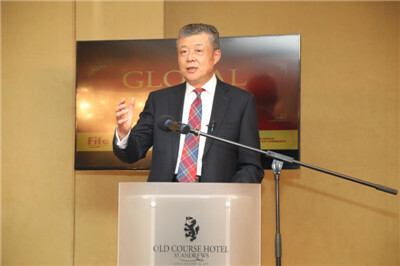 Chinese investment made strong headway in Scotland. Many Chinese companies, such as China National Offshore Oil Corporation, SDIC Power, BYD and Ctrip, have set up businesses in Scotland. This has become a new highlight of our cooperation. Here I want to mention the story of Todd & Duncan by the beautiful Loch Leven. This Scottish manufacturer of cashmere yarn established in 1867 ran into difficulties in 2009 and was acquired by a Chinese cashmere producer. This acquisition not only secured over 200 jobs, but also helped the century-old company get out of the red in 2017. This has been a valuable contribution to the local community and its economy. The third "E" is enthusiastic cultural and people-to-people exchanges. In 2017, the number of Chinese tourists visiting Scotland increased by over 120% compared with last year, with spending per person up by 49.9%. Edinburgh has become the second most popular British city for Chinese tourists after London. The world-famous Edinburgh Art Festival drew over 50 Chinese art troupes in 2017. Scotland is home to many world-leading universities. The University of St Andrews I visited this morning is one of them. These universities are building closer partnerships with Chinese universities, and have drawn over 10,000 Chinese students to study here in Scotland. Scotland is also home to five Confucius Institutes and forty-four Confucius Classrooms. In proportion to its population, Scotland has more Confucius Institutes and Classrooms than any other parts of the world. Tens of thousands of primary and middle school students here are learning the Chinese language and Chinese culture. I am happy to tell you that yesterday I unveiled the Confucius Classroom in the farthest and northernmost part of Scotland, and of Britain. That is Mid Yell Junior High School. These "three E's" could not have been possible without the joint efforts of people of all sectors from China and Scotland, including the Scottish Chamber of Commerce (SCC). SCC has long been committed to expanding cooperation between Scotland and China in trade, investment, energy and infrastructure development. Last month, an MOU was signed between SCC and China on advancing trade between the two sides and encouraging Scottish firms to engage in Belt and Road development. I would like to take this opportunity to express my appreciation to SCC for your efforts and contribution. First, take a long-term view. The world is undergoing profound development and transformation. Against this background, the Chinese and British leaders made the historic decision to forge a China-UK "Golden Era". This has set the compass and charted the course for China-UK relationship as a whole. It is also an important guarantee for the steady and long-term trade and economic cooperation between China and Scotland. China-Scotland cooperation is not a one-shot deal. It is important that we avoid short-sightedness and take a long term view of our economic and trade partnership. We need to make it win-win. And this will in turn boost overall China-Scotland relations and contribute to the China-UK "Golden Era". My second suggestion is to seize the opportunities. China is transitioning from high-speed growth to high-quality growth. We are taking measures to deepen supply-side structural reform. These include implementing the innovation-driven development strategy, and focusing on green finance, energy conservation, environmental protection and clean energy. China also proposed the Belt and Road Initiative to share its development opportunities and outcomes with the world. Scotland has unique strengths in processing, manufacturing, energy and innovation. The complementarity between our two sides is obvious. We should leverage our respective strengths and grab the opportunities arising from innovation, economic transformation and the Belt and Road Initiative. Together we can make the pie bigger so that everyone gets a larger share. My third suggestion is to take concrete actions. To quote President Xi, we should "roll up our sleeves" and get down to business if we are to deliver benefits to our people. China has taken concrete steps to open up its market to the world. This coming November, China will host the first International Import Expo in Shanghai. This will be a good opportunity for Scottish companies to introduce your high-quality products and services to the Chinese market and build up your brand names in China as well as in the world. I know some of the Scottish products have already won the heart of the Chinese people. With a population of 1.4 billion, we have a huge market for more of your products and services. Actions speak louder than words. Now is the time for action! President Allan and David asked me to talk about the trade dispute between China and the US, which is drawing world attention. To explain China's positions, I published three articles recently on major British newspapers, each from a different perspective. And globalisation and trade liberalisation is an irreversible trend of the times. The US announcement of investigation and tariff measures on Chinese goods pursuant to "Section 301" is a typically unilateral, protectionist move. And its accusations against China on IPR protection and technology transfer are totally wrong. Such actions of the US will do harm to both sides. They also undermine the multi-lateral trade regime and increase the risks and uncertainties in the world economy. In a sense, this trade dispute is evolving into a debate about unilateralism vs. multilateralism, about protectionism vs. free trade. The world is watching how China will act at this critical moment. President Xi has given a clear-cut answer. He said that as a responsible major country, China is willing to, together with the international community, conduct cooperation in opening up and pursue win-win results through cooperation in a bid to play a positive role in bringing bright, stable and beautiful prospects to the world. Let me share with you China's three commitments to the world. First, China is committed to upholding the multi-lateral trade regime. Trade is a key factor in world economic growth. Therefore, facilitating trade liberalisation has been the consensus of the international community. China has benefited from and contributed to the international trade regime. We are a staunch supporter for free trade. and opened about 120 sectors of the service industry to different degrees. China is now the largest trading partner of 124 countries and one of the top three export markets for goods from 54 WTO members. and contributed over 30% of world economic growth every year. China has been a major stabiliser and powerhouse for world economic growth. China will facilitate the building of the multi-lateral trade regime with the WTO as its core. And China will help foster an open, equitable and fair international trade system. Second, China is committed to further opening up its market. History has proved time and again that shutting oneself in will lead to a dead end; Opening up and inclusive cooperation are the right path leading to broad and bright prospects. Forty years ago, China decided to embark on the road of reform and opening up. Since then, China has embraced the world with open arms. We have created the "China miracle", namely, 9.5% average annual growth and over 700 million people out of poverty. China's economic development is achieved in an open market, and its future development requires greater openness of its market. Therefore, China's door of opening up will not be closed and will only open even wider. We will greatly increase market access. We will implement the opening-up measures in banking, securities, insurance and other parts of the service sector. We will raise the limit on foreign ownership in joint-venture firms involved in automobile, ship building and aircraft industries. And we will completely open up the manufacturing sector. Last weekend, China Securities Regulatory Commission released the Administrative Measures for Foreign-Invested Securities Companies. This was the most recent step to further open up China's securities sector. At the same time, we will strengthen alignment with international rules and improve transparency and rule of law, with a view to creating a favourable environment for investment. In the first half of this year, China will issue a new negative list for foreign investment and complete the implementation of pre-establishment national treatment plus a negative list. All these concrete steps are testaments to China's firm determination to greater openness. Third, China is committed to improving IP protection. Improving IP protection is the most important part in building a complete system of property protection. This is also central to China's economic competitiveness. Following a complete and systematic legal revision at the time of its accession to the WTO in 2001, China has established a full-fledged system of domestic IPR laws and regulations that conforms to international practice and reflects China's national conditions. Public awareness of IPR has been notably increased in recent years. In 2017, China paid $28.6 billion in intellectual property royalties to overseas rights owners -- 15 times the amount paid in 2001. Of course, as the largest developing country, China still needs to deal with "growing pains" in IP protection. On the one hand, China will step up law enforcement. The State Intellectual Property Office is being restructured to improve the IP management system. The process of amending the Patent Law will be accelerated, which will strengthen the legal measures against IPR infringement. On the other hand, China is enhancing its cooperation with other countries on IP protection. We will make full use of our IP dialogues with the UK, the EU and the US to build up international consensus. We hope to work with our international partners to build a global IP system that is more balanced, inclusive and universally beneficial. The UK established itself as a global power through trade. For hundreds of years, Britain has pursued free trade and led the global efforts in facilitating trade liberalisation. Today, Britain still has free trade running in its blood. In 1776, Adam Smith, the famous Scottish philosopher and economist, published The Wealth of Nations. This was the work that laid the theoretical foundation for free trade in modern times. In 1902, this book was translated into Chinese by Yan Fu, one of the first Chinese students in Britain. Due to historical reasons, China was a late starter in foreign trade. But we have caught up quickly and we are now the world's largest trader in goods. China and the UK have extensive common interests in upholding the multi-lateral trade regime and opposing protectionism. The Scottish people say, "There is no greater fraud than a promise not kept." A similar saying in China reads, "One cannot establish himself without credibility." China and the UK are committed to free trade. Now, in face of surging protectionism and anti-globalisation backlash, it is all the more important that we stay true to our commitment. I sincerely hope that our two countries will join hands in upholding free trade and leading the trend of openness and connectivity. Together we can make greater contribution to the building of an open world economy and a community with a shared future for mankind. Now, I would like to take your questions. 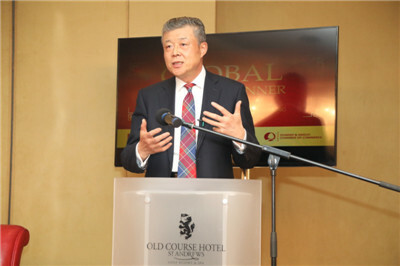 On May 2, Ambassador Liu delivered the above keynote speech at a dinner hosted by the Scottish Chambers of Commerce. 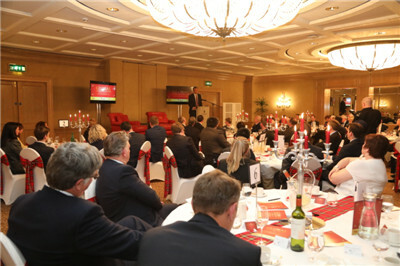 About 150 people attended the event, including John Swinney MSP, Deputy First Minister of Scotland, Tim Allan FRSA, President of Scottish Chambers of Commerce (SCC), Dean Lockhart MSP, Professor Sally Mapstone, Principal and Vice-Chancellor of the University of St Andrews, and representatives from Scottish political, business, and educational sectors. After the speech, Ambassador Liu answered questions on China-UK cooperation on the Belt and Road Initiative, British investment in China, British beef exports to China, studying in China, and China-UK visa facilitation measures.